Judith Frye Helzner discusses reproductive and sexual health education at a Planned Parenthood General Action event Wednesday. Helzner said that young people must take initiative to learn about sexual and reproductive health. 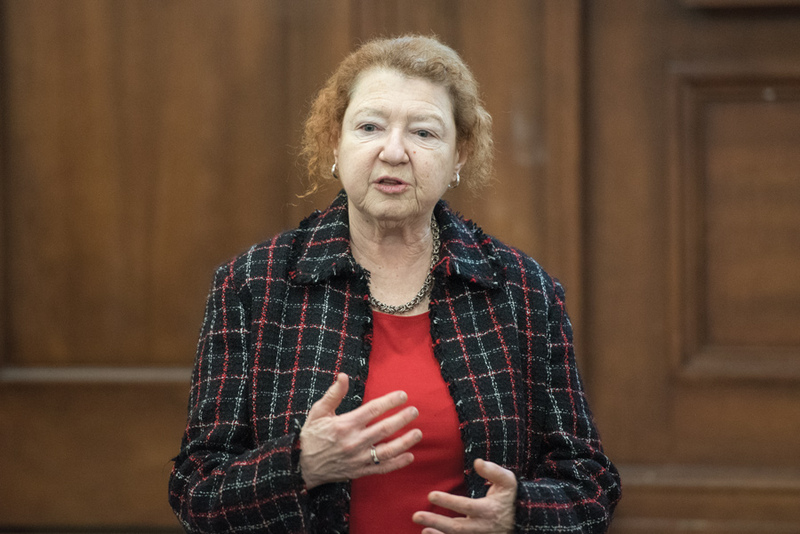 Population and reproductive health consultant Judith Frye Helzner discussed her 40-year career in global reproductive health at a Wednesday event organized by the Northwestern chapter of Planned Parenthood Generation Action. Helzner’s presentation primarily focused on her career path and how it furthered her goals to increase knowledge of issues regarding women’s reproductive rights and sexuality education. Neha Pashankar, the co-chair of the sexual and reproductive health committee within PPGA, reached out to Helzner and organized the event. She said she wanted the presentation to focus on Helzner’s profession because of the “human-focused” nature of her experiences. Helzner began her career working at non-profit organizations, starting in 1977 at Pathfinder International, an organization working to increase access to sexual and reproductive health services. She later moved to the International Women’s Health Coalition in 1985, where she worked as the Latin America Program Officer and CFO. In 1987, Helzner became the director of program coordination at the International Planned Parenthood Federation/Western Hemisphere Region. Later, she worked as the director of sexual and reproductive health, where she advocated for an increased focus on sexuality issues and gender and reproductive rights. After spending over a decade working at the MacArthur Foundation, Helzner became an independent consultant — partnering with organizations and companies to promote reproductive and sexual health education. The most rewarding part of Helzner’s career, she said, is not a single, specific project that she’s worked on. Rather, it’s the overall impact of all the work that she’s done. “What’s given me satisfaction is the idea that I’ve been some kind of agent of change in all the jobs that I’ve had, to move our field along, to drag people, kicking and screaming, towards that goal of more attention to reproductive and sexual health and rights,” Helzner said. She added how she thought “meaningful youth engagement” was essential in order to increase young people’s knowledge of sexuality education because when they get older, they will be responsible to promote the spread of effective and accurate reproductive and sexuality health education. SESP first-year Marissa Levy, a member of PPGA, agreed with Helzner, and emphasized how important it is to increase understanding of women’s issues on campus, especially among male students.